Hidden Child. By Isaac Millman. Farrar, Straus & Giroux/Frances Foster Books, 73 pp., $18. Ages 7–9. At the age of seven, Isaac Millman escaped from Paris and went into hiding in France after his parents were arrested by the Nazis. In Hidden Child he tells his story through an artful balance of spare but vivid prose, soft-focused paintings, and black-and-white photos. Millman neither denies nor exaggerates the dangers he faced as he writes of days full of terrors in cities and the countryside — an arrest by Nazis at bayonet-point, confinement in a prison cell with five others, abandonment on the streets of Paris by a man paid to keep him safe, a stay at a hospital used as a safe house for children of deported Jews (where he had to feign illness and use a wheelchair). But he also tells of small comforts, such a finding clusters of tiny white strawberries that helped him avoid starvation and playing with a white puppy at a shelter set up for the children of missing parents after the Liberation. His parents died in Auschwitz, and, at 15, he left France for a new life in the U.S. with a loving couple who adopted him. Hidden Child is an oversized picture-book-with-chapters that would suit many children who are learning about the Nazis but are too young for The Diary of Anne Frank. It offers a sensitive introduction to the Holocaust for children of any faith and a potential Hanukkah gift that families will remember far longer than eight nights. 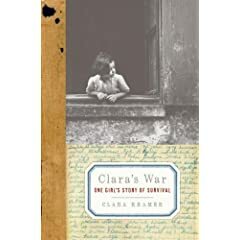 Recommended if … you’re looking for a gentle but historically accurate book about the Holocaust that gives a child’s-eye-view of its events. This book would interest some children older than age 9 and many adults. FYI: Amazon had this book in stock and available for overnight delivery on December 14 www.amazon.com. Watch for more reviews of children’s books in the Children’s Corner every Saturday on One-Minute Book Reviews. This Saturday: Children’s books about pirates.